Hi, I am interested in your 1932 Ford Other Ford Models (stock #4710-ATL) listed on Autotrader for $40,995. I'd like to get more information about this vehicle and confirm its availability. 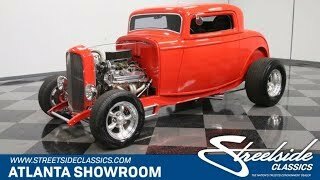 Close your eyes and think the words tricked out street rod - an image closely resembling this 1932 Ford Window 3-Window coupe is very likely to be conjured up. Its a great looking modded ride that combines a lightweight body with plenty of power to make for a driving experience you wont want to pull yourself away from. With its prominent front grille leading the way, this is one well-configured ride. A chopped cabin and just the right inclined stance give it a hunkered down appearance and the open engine compartment puts the powerplant on full display while the fender-less look in back does the same for the massive rubber thats on board. The fiberglass body on this classic makes for an outstanding power to weight ratio and has come through the years in terrific shape - there are no stress cracks to be found and the red paint it wears is in fine form, with a nice slick texture and a great shine. Below, the sturdy foundation has served its purpose well - with the prominent contours running along the sides, it would stand out right away if anything was amiss as far as alignment is concerned. The interior features some great details, starting with a pair of plushly-padded gray tweed buckets that show virtually no wear and feature sharp red pinstripes that tie in perfectly with the door panels theyre bracketed by. Climb inside and youll notice right away that this is one roomy coupe - especially as far as legroom is concerned. Just beyond the steering wheel sitting on its tilting chrome column, the dash area features a collection of Daytona Instruments gauges recessed into a chrome panel thats surrounded by a smooth red backdrop. There are vents at each side of the dash to bring cool air into the cabin - air conditioning is a welcome feature often overlooked in cars of this niche and with some servicing this one will be back in top form. The Lokar shifter looks awesome on the compact center console, which also features a pair of cupholders and switches to operate the power windows. Audio comes via a Pioneer AM/FM/CD seamlessly mounted above in the headliner. In back, the storage area features a power-operated deck lid and is finished off with carpeted sides, with the center panel bearing a Ford emblem in relief - its really a great touch. The open engine compartment puts heavy emphasis on a powerplant with plenty of visual appeal and the 383 cubic inch V8 aboard here certainly has that covered. Dressed with an oblong chrome air cleaner, chrome valve covers and a number of other eye-catching components, its a great looking engine and is armed with a pair of Edelbrock aluminum heads and 4-barrel carb to provide plenty of power - a 350 serves as its foundation and the extra displacement comes from a lengthened stroke, so theres also all kinds of torque to push you back in your seat when you step into it. A Mallory ignition maximizes available spark, while an aluminum radiator paired with an electric fan keeps operating temperatures in check. The engine pairs with a smooth-shifting 3-speed automatic TH350 transmission, so this streetrod is a great driver that also possesses plenty of stopping ability due to the Wilwood power brakes at all four corners, as well as a surprisingly refined ride - complements of the coilover rear suspension. This vintage Ford prowls the pavement on a set of America Racing Torq Thrust wheels that position a pair of massive Mickey Thompson Sportsman tires in back for maximum asphalt-gripping ability. The weather is warming up, the boulevard beckons and this 1932 Ford 3 Window Coupe stands ready to provide plenty of future fun. Call today!